This magnificent 1852 hand colored case map of the Philippines was issued by Dr. Morata and Francisco Coello of Madrid. In 32 folding sections mounted onto linen. Covers the Philippines and extends south from Manila Bay to the Island of Mindano and west to the Island of Palawan or Paragua. Features numerous insets depicting important nautical passages and ports. 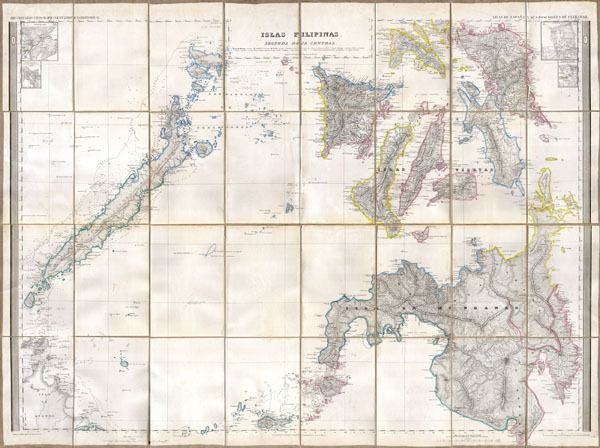 Perhaps the finest and most detailed 19th century map of the Philippines ever published. Comes with original linen slip case and publisher's label. Note: This map was part of three map issue covering the entirety of the Philippines. Fine or perfect condition with wide clean margins. Mounted on original linen. Includes original linen slipcase with publisher’s label.